As a result of a DEAP education, students will be able to use their cultural, vocational and academic skills to analyze their surroundings in order to plan the transformation of their community and their world, live a healthy life and use the tools they were taught to achieve holistic wellness, use their understanding of identity, and its impact on local and global communities to promote the restoration and perpetuation of Diné culture, and honor the history and the legacy of the DZIŁ DITŁ'OOÍ area by consciously balancing the needs of the land with the needs of the people. 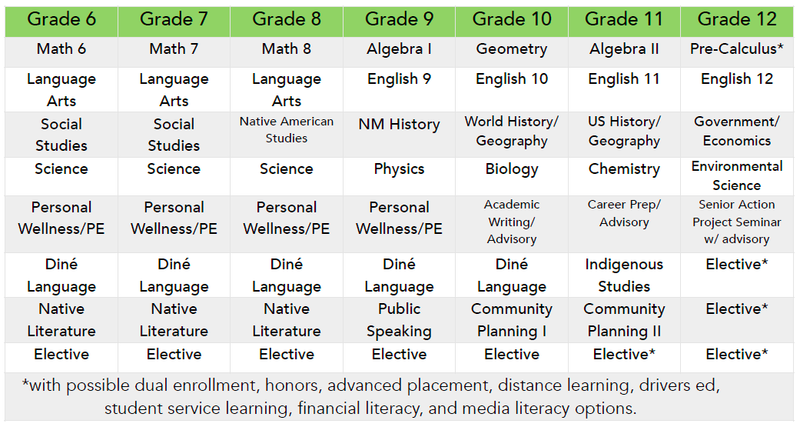 All DEAP courses are aligned to both the New Mexico’s Common Core State Standards and Diné Standards for each grade. DEAP’s focus on Agriculture Science, Diné Culture Revitalization, Personal Wellness and Community Action and Service Learning will infuse core subjects. DEAP educators develop cross-curricular units that honor DEAP’s mission in a culturally relevant way.